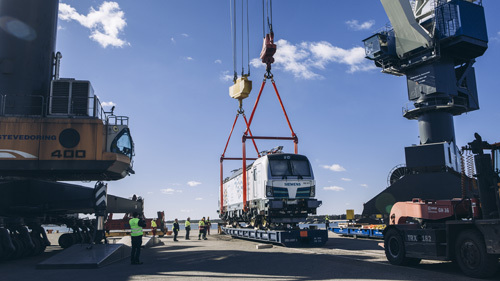 Siemens has brought the Vectron electric locomotive to Finland for testing. A modified version of the locomotive type, which is in use in Europe, is to be built for northern conditions. VR Group has ordered 80 of the new electric locomotives from Siemens. The locomotive type, which is to be ordered from Siemens, will be tailored to be compatible with Finland's rail network and with challenging weather conditions, and will be thoroughly tested before it is taken into use. The Vectron, which will operate in Finland in the spring and summer, does not yet fully correspond with the locomotive that will be taken into use by VR Group. Tests will be conducted on the Vectron in Finland to ascertain how the locomotive and the bogie function at different speeds on different kinds of segments of track. The new monitoring systems of the electric locomotive will also be tested on the Finnish rail network. The characteristics and appearance of the Vectron to be tested differ from those of the locomotive to be used by VR Group. Because of the challenging snow conditions of the north, the structure of the chassis of the locomotive is to be developed, the air intake vents will be moved to the roof, and the front of the locomotive will be reinforced. The locomotive, tailored for the VR Group, operates in temperatures as low as -40 degrees. Under the plan, the VR Group's test runs of the electric locomotive in Finland will begin in early 2016. The first ten locomotives are to start operating in commercial transport in 2017. The aim is for all 80 locomotives to be delivered by 2026. "The electric locomotive deal is one of VR Group's many significant investments into equipment. This is the group's largest individual acquisition, with a value of more than € 300 million. The Siemens Vectrons will replace the first Soviet-built electric locomotives in phases", says Mikael Aro, President and CEO of VR Group. "These new locomotives are a magnificent example of how Siemens has been involved in building Finnish society already for 160 years. Thanks to the Vectrons, rail traffic will become more efficient and will be more environmentally friendly than before. It might be said that we are an engine of electric transport", quips Janne Öhman, CEO of Siemens Finland. Vectron will be the most efficient locomotive of the VR Group. The output of 6,400 kW is equal to that of about 60 - 70 private cars. An electric locomotive can pull a freight train weighing more than 2,000 tons. The locomotive is suitable for fast passenger transport at speeds of 200 kilometres an hour, as well as for heavy goods transport. The new electric locomotives will improve the efficiency and environmental friendliness of VR Transpoint's goods transport. A greater proportion of goods transport can be handled using electric power. Thanks to electric locomotives, trains on VR's passenger transport will be moving faster, more securely, and with greater energy efficiency.